Ultrakiire BiTec sensoriga valgusmõõtur kõrge spektri eraldusvõimega 280 – 1050 nm. Lühike mõõteaeg saavutatakse elektroonilise katikuga ja mitme protsessoriga võimaldades ka välgatuse mõõtmist. Võimalus ühendada eri mõõdus integreeritud keradega kõrge kvaliteedilisteks fotomeetrilisteks, radiomeetrilisteks ja kolorimeetrilisteks mõõtmisteks. BTS2048-VL ultra-fast BiTec sensor light meter for high-quality photometric, radiometric, spectral-radiometric and colorimetric measurements. The BTS2048-VL is a high-quality light meter whose compact design and elaborate optical, electronic and mechanical interfaces make it ideal for integration in complex industrial and scientific measurement tasks. One of the outstanding features of this exceptional light meter is its BiTec light sensor. This combines the special properties of a silicon photodiode with those of a back-thinned CCD diode array. Through bilateral correction of measurement signals from both sensors, the BiTec sensor ensures extremely precise photometric and spectral-radiometric measurement values over a large dynamic range. The diode array comprising of 2048 pixels has a utilizable spectral responsivity range between 280 nm and 1050 nm. It has a 2 nm optical bandwidth and a pixel resolution of 0.4 nm/pixel. Due to the back-thinned technology, this CCD chip is substantially more sensitive as compared to conventional front-illuminated CCD chips. Another of its features is that the back-thinned CCD detector is equipped with an electronic shutter. This makes the measurement within a light flash possible. Together with the diverse trigger functions, integration times of between 2 µs and 4000 ms, the powerful micro-processor and the very fast LAN interface (7 ms for a complete data file), the BTS2048-VL qualifies for LED binning applications as well as for measurement of light flashes. To facilitate optimum use of the CCD sensor‘s dynamic range, there is a remote controlled filter wheel (Open, Closed, OD1 and OD2) located in the optical beam path. This enables amplification of the dynamic range of the CCD sensor and offset compensation to additionally ensure precise measurement of light sources having varying intensities. As for the input optics, the BTS2048-VL has an incorporated diffuser window with a cosine corrected field of view. The fact that a light guide has not been used to this effect makes room for improved photosensitivity and calibration stability for reduced measurement uncertainty. The f2 adjustment of the cosine corrected field of view to less than 3% makes it possible to use the BTS2048-VL for direct light measurement in absolute photometric, colorimetric and radiometric measurands as well. In connection with integrating spheres, the BTS2048-VL is the optimal light meter for measurement of the luminous flux, spectral radiant flux and luminous color. The prefixed diffuser window can be positioned in the sphere such that an uninterrupted hemispherical field of view is created. This thereby enables the sphere photometer to fulfill one of the essential requirements for the LM79 as well as meet other standards. Gigahertz-Optik manufactures a wide range of integrating spheres as well as the necessary accessories e.g. calibration standards. 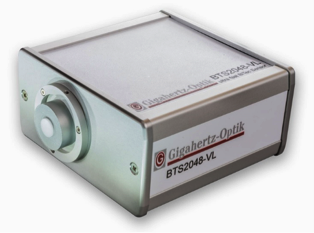 Gigahertz-Optik manufactures goniometers in different designs. The BTS2048-VL is controlled via a USB 2.0 or ethernet. With regards to the communication speed, ethernet port is superior to the USB 2.0 interface. Furthermore, the amount of data to be sent is thereby limited so that data preparation occurs in the BTS2048-VL. For this purpose, an independent, high-performance microprocessor is incorporated.